House-hunters may envisage wholly transforming their new property, but Camus, an outstanding coastal croft with an idyllic sea view, is more inclined to transform its owner. Camus is a tranquil, modern 4-bedroom house, lying within the small scattered settlement of South Cuil, overlooking picturesque Cuil Bay – a quiet and peaceful beach, which is just one of three within easy walking distance. The property, which stands on 39.75 acres, is approximately one mile south of the village of Duror of Appin, which boasts an established and vibrant community, and is ideally situated to allow access to some of the finest scenery in the West Highlands. 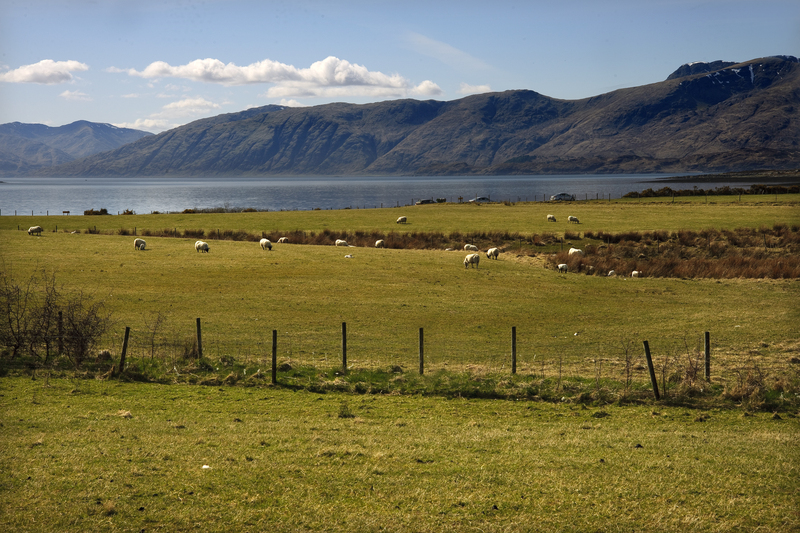 With stunning views looking out over the sea to the hills of Kingairloch and towards the islands of Balnagowan, Mull and Lismore, the property is on the market with Inverness-based Estate Agents and Surveyors Bell Ingram, seeking offers over £495,000. John Connolly, the current owner of the property, spoke of how purchasing his home brought about a surprising and refreshing lifestyle overhaul. John said: “Before we moved here, I was a professional engineer in the armed forces. On my retirement we wanted to do something different and, although we were apprehensive at first, changing to a rural life-style was one of the best things we ever did. “Over the past 20 years we have kept a range of livestock, Hebridean sheep, Highland cattle and Tamworth pigs, and have sold our own lamb, beef and pork at local farmers’ markets. We also had the fleeces spun and sold the wool locally, throughout the UK and abroad. “We have run a successful apiary on the croft, from which we produced both blossom and heather honey that has proved very popular with both locals and visitors – and there would be scope for a buyer to continue all these activities. The property lies almost equidistant between Oban and Fort William, making it the optimal choice for those either moving to the area for employment or for those seeking a lifestyle change. The house was constructed by Roy Homes, Inverness, in 1995 from a design by Charles MacDonell – a well-known architect who has won awards for the originality and sensitivity of his designs. It is laid out over two floors, is fully double glazed and centrally heated, and comprises a dining hall, sitting room, conservatory, bedroom, bathroom and kitchen on the ground floor, with four more bedrooms and two bathrooms (one en suite) on the first floor. Outside, the formal garden has numerous established rhododendrons and shrubs, as well as herbaceous plants which provide colour at most times of the year, and features a pond which was previously stocked with rainbow and brown trout. There is also a polytunnel that allows for the production of vegetables throughout the year, and an orchard which provides a selection of fruit including pears, apples and plums. Paul Nicoll, of Bell Ingram in Oban, said: “Camus is not only one of the most attractive crofts within the area, but also one that has been exceptionally well managed over the last 20 years. It represents an excellent opportunity for an incoming purchaser to build on the solid foundations that have been established. Outdoor and sports enthusiasts will not be disappointed with a vast array of walks and climbs available in the surrounding countryside, while the ski centre at White Corries, approximately 14 miles further east, provides some of the most challenging skiing in Europe. The nearby village of Duror provides a variety of amenities including bed & breakfast, guest house, primary school and two churches. The closest town, Fort William, which is approximately 20 miles to the north of Duror, is an all-year-round tourist destination and provides a range of shopping options including supermarkets and a number of national retailers. Viewings are strictly by appointment only and can be arranged through Bell Ingram’s Oban office on01631 566 122. To find out how we can help tell your stories to the world, get in contact with us now by calling 0131 561 2244 or fill in the form below and we will get right back to you.